Beautiful New 4 Bedroom Home – Open House March 18th! Lot Size : 13,068 sq.ft. Move right into this bright & inviting 4 bedroom home nestled on a corner lot on a quiet street in desirable South Randolph neighborhood. This home features open floor plan with a gorgeous kitchen with granite island & counter tops, stainless steel appliances & a casual dining area. The Great room has wood burning fireplace & sliders to the large deck and private fenced in backyard situated on a level lot, great for entertaining. There are 2 bedrooms and 1 bathroom a few steps off the dining and another 2 bedrooms and 1 bathroom a few steps down off the living room. Hardwood floors throughout. This home was fully renovated in 2012 with new electrical, roof, plumbing, windows, vinyl siding, and much more! Fence added in 2015. 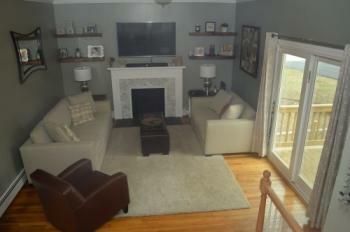 Basement offers an abundance of extra storage, W/D & walks out to backyard. Conveniently located close to areas shops, schools, parks, bus, restaurants, & easy commute to Boston. A spectacular property for easy living!